The breed standard says the Siberian Husky "does not display the possessive qualities of the guard dog, nor is he overly suspicious of strangers or aggressive with other dogs." Most Siberian Huskies are sociable with other dogs, but he has a very high prey drive and may destroy cats if not raised with them. Siberians should not be kept around rabbits, ferrets, or birds. Siberian Huskies are not Golden Retrievers. They have an independent mind and are no pushovers to raise and train. They can be manipulative, many are willful, obstinate, and dominant (they want to be the boss). They will make you prove that you can make them do things. You must show them, through absolute consistency, that you mean what you say. 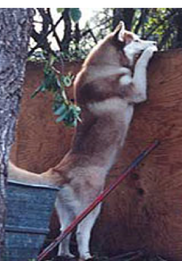 To keep your Husky in, and to keep other animals out, fences should be high, with wire sunk into the ground along the fence line to thwart digging. Gates should have high quality locks. 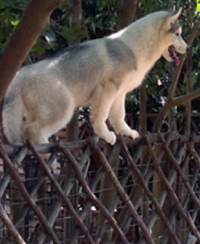 Many Siberian Huskies are clever escape artists who will go over, under, or through fences in search of adventure. Fencing must be high and secure, for he can be an escape artist, and once loose, he may run after deer and bother livestock. BOUNCINESS. 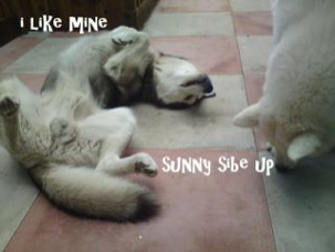 Young Siberian Huskies (up to 2yrs old) romp and jump with great vigor, and things can go flying, including people. HEAVY SHEDDING. Siberian Huskies shed a LOT. You'll find hair and fur all over your clothing, upholstery, carpeting, under your furniture, on your countertops -- even n your food. Frequent vacuuming will become a way of life. Make sure you're REALLY up for this. NOISE. Unless you live way out in the boondocks and have no neighbors and have a secure fence-line, Siberian Huskies should never be left outside in your yard, unsupervised. Their mournful howling will have your neighbors calling the cops to report the nuisance or quietly letting your Siberian Husky out of his yard so he'll wander away. Sibe coloring can vary -coats come in an array of beautiful colors, including red, black or silver and white, all black or all white and piebald (spotted-rather rare). Eyes can be blue, green, brown, black, parti-colored, or each eye a different color, all are acceptable in the breed. Male Sibes can weigh anywhere from 45-60 pounds; females between 35 and 50 pounds. They are usually smaller than their Nordic cousins, the Malamutes. The Husky has a double coat of fur, wooly and downy underneath and a thick outer coat. This means very little dirt can penetrate the coat and should make the Husky easy to groom-but often. NEVER shave a Siberian Husky’s fur. If you do not like wearing and having fur everywhere, do not get a Siberian. Siberians are working dogs - that means they need a job. They are born to pull and born to run - and can do so with heavy loads for long distances. Without stimulation, they become easily bored. Which could mean digging up your garden, running down the street onto a freeway, jumping a six foot fence or otherwise making or getting into trouble. It is critical not to let your Siberian run loose! It is in their genes to run long distances and fast! Lots of exercise and stimulation is key. Siberian Huskies are very outgoing, fun loving, gregarious, mischievous, affectionate… and exasperating animals. They love being with people and other dogs, and working in large teams in activities such as mushing (runners on snow) and carting (wheels on dry ground). Because they are so friendly with everyone no matter who, they make terrible guard dogs - kissing a burglar and begging fortreats. If you want a guard dog, please do not get a Siberian. Because they are so social, it is important they be part of the family, and not relegated to the back yard. 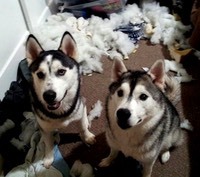 With Siberians, “obedience is optional.” Huskies are extremely intelligent and may not want to do what you say. So if you want a dog who will be at your beck and call, get a Golden Retriever! A Siberian is not the dog for you. They work with you not for you. This independent behavior comes from a long history of being entrusted with a musher’s life. If a musher tells a dog to go right, but the dog, having superior canine senses, knows the ice there will crack, the dog disobeys and goes to the left and safety. 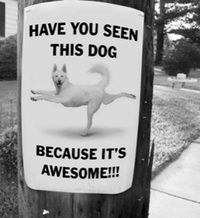 A savvy Sibe person recognizes the dog’s instincts and is grateful.